13:17. And it was, when Pharaoh had sent the people out, that God did not lead them through the way of the land of the Philistines, although that was near, for God said, “Perhaps the people will change their minds when they see war, and return to Egypt.” 18. But God led the people about, through the way of the wilderness of the Reed Sea, and the children of Israel went up armed out of the land of Egypt. 19. And Moses took Joseph’s bones with him, for he had strictly sworn the children of Israel saying, “God will surely visit you and you will carry up my bones away from here with you.” 20. And they took their journey from Sukkot and camped in Itam, at the edge of the wilderness. 21. And the LORD* went before them by day in a pillar of cloud to lead them the way, and by night in a pillar of fire, to give them light, to go by day and night. 22. He did not take away the pillar of cloud by day, or the pillar of fire by night, from before the people. 14.1. And the LORD* spoke to Moses saying, 2. “Speak to the children of Israel, to turn and camp before Pi Hakhirot, between Migdol and the sea, over against Baal-Zephon: camp by the sea before it. 3. For Pharaoh will say of the children of Israel, ‘They are entangled in the land, the wilderness has shut them in.’ 4. And I shall harden Pharaoh’s heart so he will follow after them, and I shall be honored by Pharaoh and by his entire army, so the Egyptians will know that I am the LORD*.” And they did so. 14:5. And it was told the king of Egypt that the people fled, and the heart of Pharaoh and of his servants was turned against the people and they said, “Why have we done this, that we have let Israel go from serving us?” 6. And he made his chariot ready and took his people with him. 7. And he took six hundred chosen chariots and all the chariots of Egypt, and captains over every one of them. 8. And the LORD* strengthened the heart of Pharaoh king of Egypt and he pursued after the children of Israel, and the children of Israel went out with a high hand. 9. But the Egyptians pursued after them, all the horses and chariots of Pharaoh, his horsemen and his army, and overtook them camping by the sea, beside Pi Hakhirot, before Baal Zephon. 14:10. And when Pharaoh drew near, the children of Israel lifted up their eyes and, behold, the Egyptians marched after them, and they were greatly afraid, and the children of Israel cried out to the LORD*. 11. And they said to Moses, “Have you taken us away to die in the wilderness because there were no graves in Egypt? Why have you dealt like this with us, to carry us forth out of Egypt? 12. Is this not the word that we spoke to you in Egypt saying, Let us alone, so we can serve the Egyptians? For it is better for us to serve the Egyptians, than that we should die in the wilderness.” 13. And Moses said to the people, “Do not be in awe! Stand still! See the salvation of the LORD*, (2 Chr.20:17) which He will show you today, for the Egyptians whom you have seen today, you will see them again no more forever. 27. 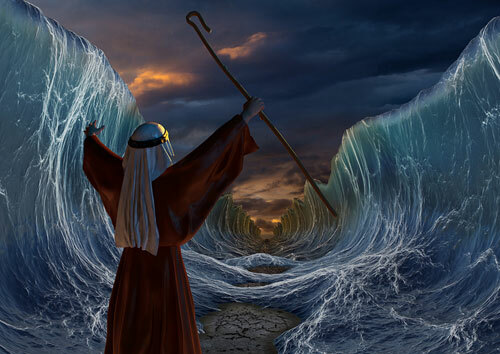 And Moses stretched forth his hand over the sea, and the sea returned to its strength when the morning appeared. And the Egyptians fled against it and the LORD* overthrew the Egyptians in the midst of the sea. 28. And the waters returned and covered the chariots, the horsemen, and the entire army of Pharaoh that came into the sea after them. There remained not so much as one of them. 29. But the children of Israel walked on dry land in the midst of the sea and the waters were a wall to them on their right hand and on their left. 30. Thus the LORD* saved Israel that day out of the hand of the Egyptians and Israel saw the Egyptians dead upon the seashore. 31. And Israel saw that great work which the LORD* did upon the Egyptians and the people revered the LORD* and believed the LORD* and his servant Moses. 15:22. So Moses brought Israel from the Reed Sea and they went out into the wilderness of Shur and they went three days in the wilderness and found no water. 15:27. And they came to Elim, where there were twelve wells of water and seventy palm trees, and they camped there by the waters. 16.1. And they took their journey from Elim, and the entire congregation of the children of Israel came to the wilderness of Sin, which is between Elim and Sinai, on the fifteenth day of the second month after their departing from the land of Egypt. 16:9. And Moses spoke to Aaron, “Say to the entire congregation of the children of Israel, Come near before the LORD*, for He has heard your murmurings!” 10. And it happened as Aaron spoke to the whole congregation of the children of Israel that they looked toward the wilderness and, behold, the glory of the LORD* appeared in the cloud. 16:17. The children of Israel did so and gathered; somemore, some less. 18. And when they measured it with an omer, the one who gathered much had nothing left over and the one who gathered little had no lack. (2 Cor. 8:15) Each person gathered according to his eating. 16:27. And it happened that some of the people went out on the seventh day to gather and they found none. 28. And the LORD* said to Moses, “How long do you refuse to keep My commandments and My Torah (Teaching)? 29. See, for the LORD* has given you the Sabbath, therefore He gives you the bread for two days on the sixth day. Each person stay in his place, let no man go out of his place on the seventh day.” 30. And the people rested on the seventh day. 31. And the House of Israel called the name of it Man. And it was like coriander seed, white, and the taste of it was like wafers made with honey. 16:32. And Moses said, “This is the thing that the LORD* commands. Fill an omer of it to be kept for your generations, so they can see the bread with which I have fed you in the wilderness, when I brought you out from the land of Egypt.” 33. And Moses said to Aaron, “Take a pot and put an omer full of man(na) in it, and lay it up before the LORD*, to be kept for your generations.” 34. So Aaron laid it up as the LORD* commanded Moses, to be kept before the Testimony. 35. And the children of Israel ate man(na) for forty years, until they came to an inhabited land. They ate man(na) until they came to the borders of the land of Canaan. 36. Now an omer is the tenth part of an ephah. 17:8. Then Amalek came and fought with Israel in Refidim. 9. And Moses said to Joshua (Y’hoshea), “Choose men from among us and go out, fight with Amalek. Tomorrow I shall stand on the top of the hill with the staff of God in my hand.” 10. So Joshua did as Moses told him and fought with Amalek, and Moses, Aaron, and Hur went up to the top of the hill. 11. And it happened, when Moses held up his hand, that Israel prevailed: and when he let down his hand, Amalek prevailed. 12. But Moses’ hands were heavy so they took a stone and put it under him and he sat on it, and Aaron and Hur held up his hands, one on one side and the other on the other side, and his hands were steady until the going down of the sun. 13. And Joshua weakened Amalek and his people with the edge of the sword. Why does it say “Reed Sea”? Is this different from the “Red Sea”? Thank you for writing. The Hebrew text has Reed Sea. The Greek and Latin name for the Reed Sea is Red Sea. Red is in our English bibles because the early English translations were from Latin, not Hebrew. I am getting so much from these Torah readings – will be getting the ONM Bible soon. My question is: how come Adonai-Nissi (Ex 17:15)is usually translated “the Lord is my Banner” or even “Jahweh Nissi”? I must say that I have never been able to understand why the Lord is my Banner (“standard” or “flag”?) – except to say that our rallying point can be the name of Jesus. “The LORD is My Miracle” is much clearer but quite different. Please, why the difference? I’m glad you asked. The Hebrew word is Nes, with miracle the primary meaning. It is also translated Sign as in signs and wonders. Are you familiar with the dredel, the small top that is used in Hanukkah celebration? The dredel has four sides with the words, one on each side: nes gadol haya sham, meaning “A great miracle happened there.” Nes is translated Miracle there. How the word Banner came in I do not know: the Vulgate (Latin) has Exaltatio (The Lord is High Praise) and the Septuagint (Greek) has Katafuge (The Lord is My Refuge). Thanks again, and this is all about the military miracle in Exodus 17:8-13, when the Israelites overcame the Amalekites. Finally; this is the Bible I’ve been looking for. Thank you for all your hard work. I’ve bought several Bibles only to give them away because they weren’t what I was looking for. This is perfect for a 1st Bible to a new believer and also for the one who has been in the scriptures for a long time. I just got it today and can’t seem to put it down. Thank you John! This was, and still is, a labor of love.